Theologian, prelate and renowned Anglican preacher and controversialist, Stillingfleet studied at St John’s College, Cambridge. 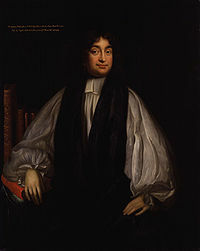 He supported the ideas of latitudinarism and Erastianism, and held many preferments, including the Deanery of St Paul’s and, after the Restoration, the Bishopric of Worchester (1689-1699). An opponent of deism and of the Unitarians, in 1697 he entered into a debate with Locke in defense of the Trinitarian dogma. Main works: The Irenicum (1659); Origines Sacrae (1663); A Rational Account of the Grounds of Protestant Religion (1664); A Letter to a Deist (1677); The Unreasonableness of Separation (1680); Discourse in Vindication of the Doctrine of the Trinity (1697). Bibliography: R.T. Carrol, The Common-Sense Philosophy of Religion of Bishop Edward Stillingfleet, The Hague, M. Nijhoff 1975; S. Hutton, Edward Stillingfleet, Henry More and the Decline of Moses Atticus: A Note on Seventeenth-Century Anglican Apologetics, in Philosophy, Science and Religion in England 1640-1700, Cambridge, Cambridge University Press 1992, pp. 68-84; S. Hutton, Science, Philosophy, and Atheism. 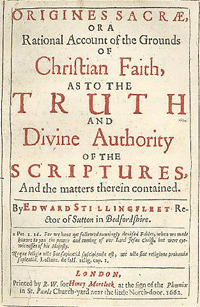 Edward Stillingfleet’s Defence of Religion, in Scepticism and Irreligion in Seventeenth and Eighteenth Centuries, Leiden-New York-Köln, Brill 1993, pp. 102-120. At his death, Stillingfleet left a library of nearly 10,000 books, purchased for £2,500 by Narcissus Marsh and today part of Marsh’s Library in Dublin, of which it is the most important collection. His collection of manuscripts was purchased by Robert Harley, and is now held by the British Museum along with Harley’s manuscripts. The index of the catalogue is in part illegible. The collection is divided into 16 thematic sections (A-P) and in subsections based on collocation (tabulae) and format. Within each tabula, volumes of varying formats are often listed one after another, and in many cases there are additions, anticipations, supplements and internal cross-references among the various sections.